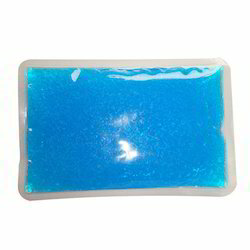 Prominent & Leading Manufacturer from Chennai, we offer blue gel ice pack. Our Blue Gel Ice Pack is durable, reusable and comfortable to give a long-lasting soothing relief. It is also a heat pack when put in the microwave. Our Products guaranteed to stay soft and flexible. It consists of a non-toxic gel that never pushes away from the injured site. The blue ice packs are designed to keep the optimally desired cold (between 40 to 50 degrees) for over 20 minutes when applied. This is a built-in safety component of our blue gel ice packs. The standard recommended treatment time is 15 minutes.